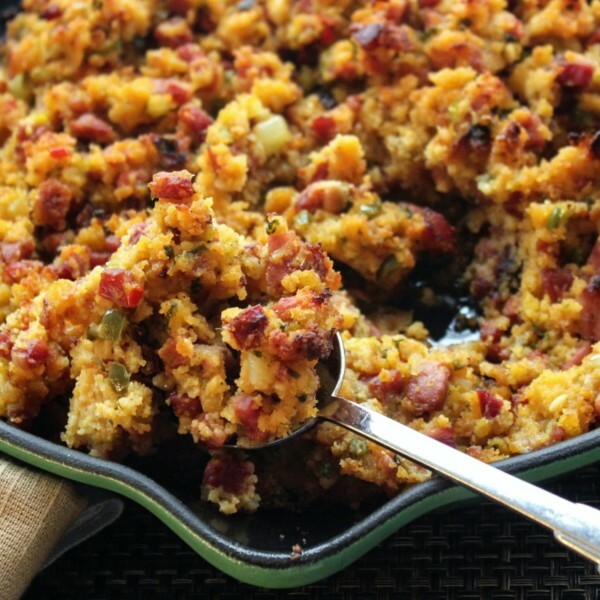 This cornbread and andouille dressing is a Thanksgiving tradition in my household. It will be a spicy addition to your menu and a yummy topic at your dinner table. ~Preheat the oven to 350 degrees F. Generously butter a 13×9” baking dish and set aside. ~In a large skillet, cook the sausage until brown and the fat is rendered, about 5 minutes. Add onions, bell peppers, garlic, and cook for two minutes. ~Remove from the heat and transfer to a large bowl to cool. ~With your fingers, crumble the cornbread into the bowl. I typically use 1.5 of the pre-baked cornbread, add more depending on how moist you like your stuffing. ~Add salt, green onions, thyme, pepper, cayenne (Add to taste; I always add extra), eggs, and mix well with your hands. ~Add chicken broth ½ cup at a time (add slowly) until mixture is moist but not mushy. ~Transfer to prepared dish and cover with aluminum foil. Bake until heated through, about 25 minutes. ~Uncover and bake until golden brown, about 15 minutes. Your belly and your family will thank you. Thank you, Emeril Lagasse, for this wonderful recipe. To checkout more of his great recipes Click Here.